Pogoplug Pro Boot issues, maybe bricked? tried installing Debian overstock software and it was getting stuck during boot at some point. Redid the rootfs usb stick and now all I get is some gibberish with Reset IDE SATA PHY not ready. It also would not stop the boot if I press any key during the 10 to 0 countdown at the beginning of the process. I've attached a .jpg of the putty serial connection messages. Also, can someone tell me how to select all those messages in Putty as text? It would probably be much easier to post than making a screen shot and than attaching jpegs. Re: Pogoplug Pro Boot issues, maybe bricked? > was getting stuck during boot at some point. > some gibberish with Reset IDE SATA PHY not ready. It does look good at the beginning. The SATA and USB are scanned by u-boot to look for the kernel files. So it is normal to see SATA not ready if nothing plugged in other than USB. 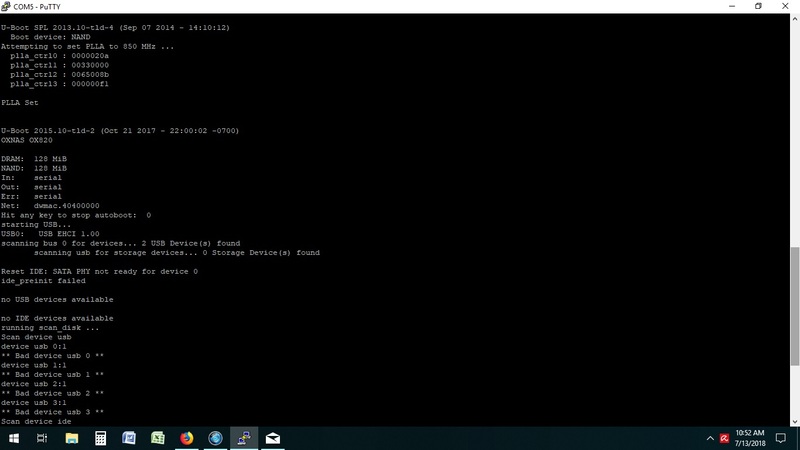 Either your serial connection TX (on WIndows box) to RX (on Pogo Pro) is faulty, or the communication parmaters are not correct. Highlight all the text and copy by right-click-Copy or Control-C, and then paste to a notepad by right-click-Paste or Control-V. The boot looks OK so far, but I need to see the rest of the log to see why it got stuck. I fiddled with it a little more, modified some stuff with setenv and now I'm in even deeper water - it does not detect the usb drive. I am trying to get it to run the Debian-3.17.0_jessie_full-oxnas-tld-1-rootfs-bodhi.tar.bz image to work on this box. The good news is that I can interrupt the boot and run commands but the "usb start" command only detects the usb hub and not the usb drive. I can boot into ubuntu and recreate the usb drive with the file above. Could you walk me through setting up the environment via setenv so I can run this image? All I get now is a "reset error" if I let it go through the countdown and boot. Also, given the uBoot I have in place, do I have to modify anything in the roof fs given the image I plan to use? Tried copying the Putty text in Linux and no luck, for some reason it selects but does not copy, depite of the supposedly "automatic copy" as states in all the docs, maybe because I run it from command line as root, otherwise it cannot access the /dev/ttyUSB0 and crashes. HA, HA, the 64 bit version of Putty for Windows works a little better, it copies output. Just remounted the usb drive in Ubuntu and did a sync followed by a umount and that tried booting the pogo again, this time with the Windows Putty connected. It will not log anything for some reason but allows me to copy the text in the console. Following is the output from the console. I also created a uEnv file, I can copy the content on the file and post it if needed, it's a copy-paste from one of your posts on installing Debian. [    0.170165] SMP: Total of 2 processors activated. [    0.330588] RPC: Registered named UNIX socket transport module. [    0.330608] RPC: Registered udp transport module. [    0.330621] RPC: Registered tcp transport module. [    0.330634] RPC: Registered tcp NFSv4.1 backchannel transport module. [    0.550586] Installing knfsd (copyright (C) 1996 okir@monad.swb.de). [    1.289661] 0x000000000000-0x000000e00000 : "boot"
[    1.295920] 0x000000e00000-0x000008000000 : "data"
ALERT! /dev/disk/by-label/rootfs does not exist. Dropping to a shell! Mod edit: please post log in code tags (use the Formtted Code button on the far right, above your post edit box). Edited 1 time(s). Last edit at 07/13/2018 08:07PM by bodhi. The boot log looks very good. Nothing wrong with your u-boot envs. BTW, the way Putty format your log still gives some problem (lines are truncated at the right side, I supect because of the tab or eol character being appended. However, I can still read it and see the kernel has booted OK. The mounting of the rootfs is the problem. So retrace your step when you create the rootfs. - Were you being root user the whole time? - Did you label the USB rootfs partition as rootfs? - Is there only 1 partition on this USB drive, and it was formatted as Ext3? If you post the log what you did during USB rootfs creation, I'll check it for you. following is the commands in terminal to create the disk. I actually created 2 of them using identically the same commands and 1 is not working but the other (old 2gb cruiser micro) works. Created a new GPT disklabel (GUID: 63463574-DD95-8342-B287-547BB3A96789). Created a new partition 1 of type 'Linux filesystem' and of size 1.9 GiB. Partition #1 contains a ext3 signature. - Installed packages: nano, avahi, ntp, busybox-syslogd (log to RAM), htop, dialog, bz2, iperf, ethtool, sysvinit-core, sysvinit, sysvinit-utils, mtd-utils. I know I took a parallel road on extracting that archive, for some reason my ubuntu box did not want to execute the tar command on it so I extracted the files in the tarball with 7zip under windows and than just copied them recursively. I cannon find any other difference in between the commands I used to create the original rootfs and the one that works. The thing that baffles me is that both the usb created originally and the one created with the second command mount automatically under ubuntu with a "rootfs" label bun only the second one works properly. Thank you very much for helping!!! > windows and than just copied them recursively. What you did above is not going to work. You must extract it using tar and being root user on a Linux box. So you need to become root on your Ubuntu box and run tar. The drive worked until I rebooted and than nothing. I made another drive on Linux exactly according to the instructions. It worked once and upon reboot the same story. I made a couple more drives, including an usb hdd and the story repeats itself every time: it boots, I reboot is and the same error. I stopped the boot process and ran some commands, the output of them is below. Can you please help me figure out what is wrong, I have a feeling it's my env variables that are messed up. If you need me to I can switch back to the linux, make another drive and post the exact command but it looks like the drive works IF the controller / drive gets initialised properly, which is not happening under automated boot. [    0.190154] SMP: Total of 2 processors activated (678.29 BogoMIPS). [    0.415165] RPC: Registered named UNIX socket transport module. [    0.415185] RPC: Registered udp transport module. [    0.415198] RPC: Registered tcp transport module. [    0.415208] RPC: Registered tcp NFSv4.1 backchannel transport module. [    0.909642] Installing knfsd (copyright (C) 1996 okir@monad.swb.de). [    1.700257] 0x000000000000-0x000000e00000 : "boot"
[    1.707048] 0x000000e00000-0x000008000000 : "data"
[    2.944512] usb 1-1.3: Manufacturer: Sunplus Innovation Technology. bound to 192.168.18.5 -- renewal in 901 seconds. INIT: Sending processes the TER[info] Using makefile-style concurrent boot in runlevel 0. [ ok ] Unmounting temporary filesystems...done. [ ok ] Deactivating swap...done. and this is the USB stick doing the same thing. Actually the stick half the time will not boot even if I interrupt the boot sequence and initialize the usb manually. [    0.170160] SMP: Total of 2 processors activated. [    0.330554] RPC: Registered named UNIX socket transport module. [    0.330575] RPC: Registered udp transport module. [    0.330585] RPC: Registered tcp transport module. [    0.330598] RPC: Registered tcp NFSv4.1 backchannel transport module. [    0.550576] Installing knfsd (copyright (C) 1996 okir@monad.swb.de). [    1.292421] 0x000000000000-0x000000e00000 : "boot"
[    1.298547] 0x000000e00000-0x000008000000 : "data"
bound to 192.168.18.5 -- renewal in 896 seconds. [    0.170168] SMP: Total of 2 processors activated. [    0.329602] RPC: Registered named UNIX socket transport module. [    0.329623] RPC: Registered udp transport module. [    0.329633] RPC: Registered tcp transport module. [    0.329646] RPC: Registered tcp NFSv4.1 backchannel transport module. [    0.549480] Installing knfsd (copyright (C) 1996 okir@monad.swb.de). [    1.332216] 0x000000000000-0x000000e00000 : "boot"
[    1.338414] 0x000000e00000-0x000008000000 : "data"
bound to 192.168.18.5 -- renewal in 850 seconds. In both cases (USB flash and USB HDD) you got this error if you boot automatically. I think your power suply is the suspect. Let's see if we can adjust your envs to make it a little bit more slow in booting to allow time for the power to "spinup" the drive. Let it boot automatically and observe serial console to see if same error occurrs. Edited 2 time(s). Last edit at 07/17/2018 05:02PM by bodhi. I think you are correct. I just tried it like 10 times and I get the above or the error in the previous post. It does that with any of the 3 ub drives I tried as well as with the usb hdd. sequence with no issues regardless of the stick or hdd I use. I also let it boot off the usb stick twice already and it went through with no hitch. What I cannon understand is why it boots with 3usb sticks and an USB powered hdd attached with no issues whatsoever once I took out that wireless card. Does the card consume that much? Or am I just being lucky that it boots now and it will act up later? or it was a defective wifi card? I might have another card off a netbook but i'm not sure it is half size. If I can find it I will try and see how it acts with that one. and now I have another issue, this thing is CURSED!!!! doesn't even matter what I plug into it, if I let it autoboot or interrupt and try manually initializing usb. I think this thing is headed to the recycling bin unless someone can point me into a different direction. Plug only the USB flash drive to the port next to the ethernet port in the back. Unplug everything else. Make sure you enter the right envs (I've modified this twice). This time we go back to "usb start". most definitely a hardware problem, it boots even with autoboot just fine as long as I leave it alone or about 30 min. If I try and reboot or shut down and restart immediately it acts up randomly, the more I use it (like the dist-upgrade I did) the more more it acts up. Do you know what kind of power it takes? I have some power bricks around the house and could try and rig something to test this idea. > the more more it acts up. Yes. It sounds more and more the culprit is the power supply. > and rig something to test this idea. I'm not near my plugs right now. But as I recall it is 120V coming in. And at the output of the power supply, it must be either 12V or 5V. Please be careful! that 120V is exposed on the power supply board. yup, it's a little power board at the base of the device, takes 120 via a tv style power cord and puts out god knows what. I could try and measure it but not sure how accurate that would be, especially given something is acting up. An than there's the question of amperage, I assume having 4 USB ports it would require something of at least 3 amps output. Took out the power board, it supplies 11.95V at no load, makes a buzzing loud noise under no load so I assume some caps or something else is going on it. Connected a 2AMP 12V power supply and the issue has not surfaced since. Ordered a 12V 5A power board off EBay and will update once I have that installed. Thank you for the help figuring this out! Veriqster, Did you ever hook up the 12v 5a or was the 12v 2a sufficient? the 2A 12V power brick is more than sufficient for running this thing. In fact it will power a 3.5in HDD as well with no problem. I have another pogo and, be that happenstance or just my luck but in my experience the power board in these things are bottom of the barrel or not designed for ANY load. While this one was having issues even booting with the stock board, the other one boots fine and works OK with no load. Put a 2.5 in HDD enclosure on it and use the drive intensively for 30-60 min and the Pogo is Guaranteed to freeze. It just stop responding to anything and drop off the network. dmesg logs do not show anything so it's probably something deep in the kernel or hardware. Neither of them shows any issues on the 2A 12V power brick. The external HDD can be wired directly to the SATA port, 5V from the USB connector, 12V from the power connector for the board and the ground, after that one can use either 2.5 or 3.5 in drives with no issues. I've tried the instructions in the SATA thread, including the script that someone made and the step by step instructions but while it tries to boot it always freezes due to one issue or another, I suspect environment variables. I can also attest to the fact that the create_ap script work like a charm. Now just waiting on some external antenas and I'll have the access point I was wishing for. That's unescessary. What you saw in the SATA thread was a direct booting mechanism for Pogo V3. One we use for rescue purpose. The booting process is the same as for USB. Format the SATA rootfs the same way you did for the USB drive, and then plug in and boot with that. The envs for U-Boot 2015.10-tld-2 already set up to boot with either USB or SATA when it scans all the drives partitions. I would still like to get the SATA boot down pat, the first unit I bought it still (very rarely) acting up on reboot, it does not recognize the USB devices. If you can dd your drive to an iso file I'd more than happy to have a copy of that. The spinup time seemed to not be an issue, at least I did not see any. veriqster Wrote: ------------------------------------------------------- > Took out the power board, it supplies 11.95V at no > load, makes a buzzing loud noise under no load so > I assume some caps or something else is going on > it. > > Connected a 2AMP 12V power supply and the issue > has not surfaced since. > > Ordered a 12V 5A power board off EBay and will > update once I have that installed. > > Thank you for the help figuring this out!